Josh Ziman, technology product manager within the Department of Homeland Security’s Office of the Chief Technology Officer, and his team addressed the question of how much space was in their data centers by automating their records system. Automating their processes removed human error from the equation, and Ziman said that he and his team will soon be working on a similar solution for their Authorizations to Operate procedures. While automation was the most important move for DHS to handle this issue, Ziman said agencies need to evaluate their biggest constraints before any such effort. Ziman spoke at MeriTalk’s Cloud Computing Brainstorm on June 7. Ziman’s perspective is just one voice among the crowd cheering for a mind-set shift among Federal leaders who oversee software development and IT operations, or DevOps. For example, Chad Sheridan, chief information officer of the U.S. Department of Agriculture’s Risk Management Agency, said agencies should study where they fail, not where they succeed. Peter Chin, chief of Application Development and Architecture for the Administrative Offices of the U.S. Courts, said that a shift in culture must accompany software and IT modernization. He said, at the U.S. courts, DevOps is the new and exciting idea that everyone wants to be a part of. However, Chin said that his office has learned to slow down and succeed as a whole rather than seek smaller victories at the granular level. 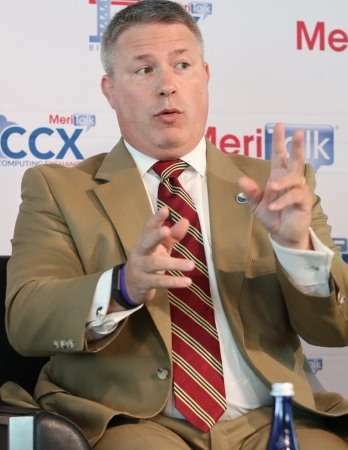 According to the panelists at MeriTalk’s event, IT leaders in the Federal government need to be accustomed to taking the blame for the inevitable hiccups that accompany modernization. Sheridan said CIOs need to don their “flak jackets,” a term he attributed to David Bray, who was named the National Geospatial-Intelligence Agency’s new chief venture officer June 6. In addition to thick-skinned leadership, Sheridan also said IT change requires patience and time. Although he acknowledged that agencies can reach stability in a legacy environment, he said change, while slow, is necessary. He said agencies will start to reap the benefits of their efforts in four or five years, not just one. Employees can serve as both an obstacle and an asset during the process of cloud adoption. Chin said that an important element of effective modernization initiatives is the teams orchestrating the technology efforts. He said agencies need to seek out bright people. On the other hand, Sheridan said that people can slow down modernization efforts because of their unwillingness to change. He admitted that technology initiatives can seem daunting, particularly to Federal employees who have grown accustomed to a certain way of doing things for the past 20 years. He also discussed how the ecosystem of service providers, technology users, and cyber needs is inextricably linked, even though Federal users often mistrust new technology. Ziman said that his supervisor, Mike Hermus, chief technology officer of DHS, is the driving force behind his office’s DevOps efforts. Ziman said that, when he and his team are listening to pitches from cloud service groups, the most compelling cases come from the companies that use their own technology. He said DHS has adopted a similar practice, using the services and techniques they recommend for agencies across the Federal government within their own offices. “We eat our own cooking,” Ziman said.